Fans celebrate during an exhibition game between C.F. Pachuca and Club America at H-E-B Park Wednesday, July 4, 2018, in McAllen. EDINBURG — On Wednesday night at H-E-B Park, the sea of orange seats was transformed into a wave of yellow jerseys. The Mexico City-based Club América had its supporters out in abundance in those yellow jerseys, but Pachuca had a few supporters, as well. 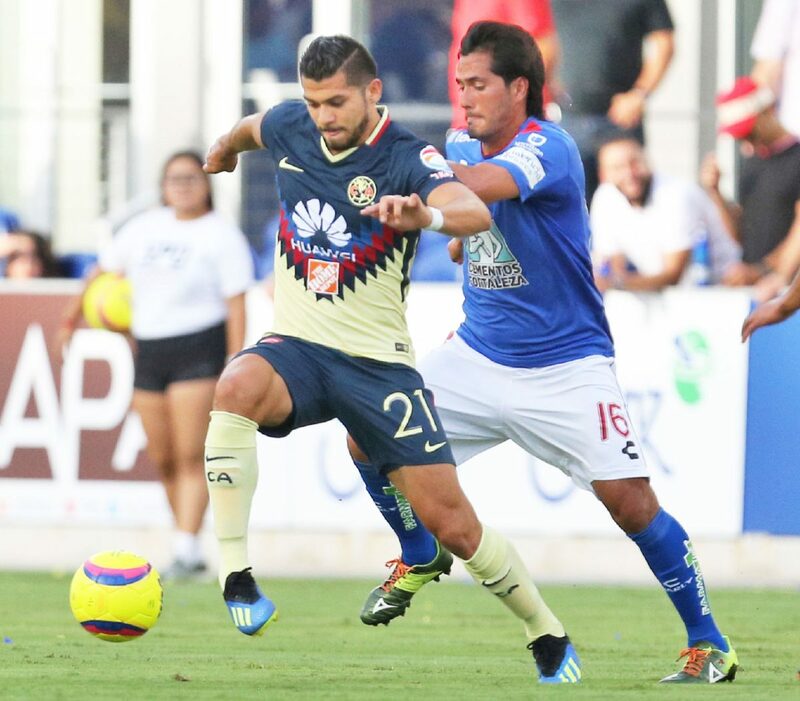 The two Liga MX teams met as part of the Tour Aguila, and América came out on top 3-2. While the rest of the nation was gathered to celebrate America’s independence, the Rio Grande Valley gathered to support Mexican futbol. C.F. Pachuca's Jorge Daniel Hernández (16) and Club America's Henry Martín (21) battle for the ball in an exhibition game at H-E-B Park Wednesday, July 4, 2018, in McAllen. C.F. Pachuca's Víctor Guzmán, left, advances the ball in a game with Club America in an exhibition game at H-E-B Park Wednesday, July 4, 2018, in McAllen. The game was sold out with an official attendance of 10,978, marking the fourth sellout in H-E-B Park history. Delia’s Tamales even debuted a food truck for the occasion. Banners and flags waved in the wind, mostly for América. 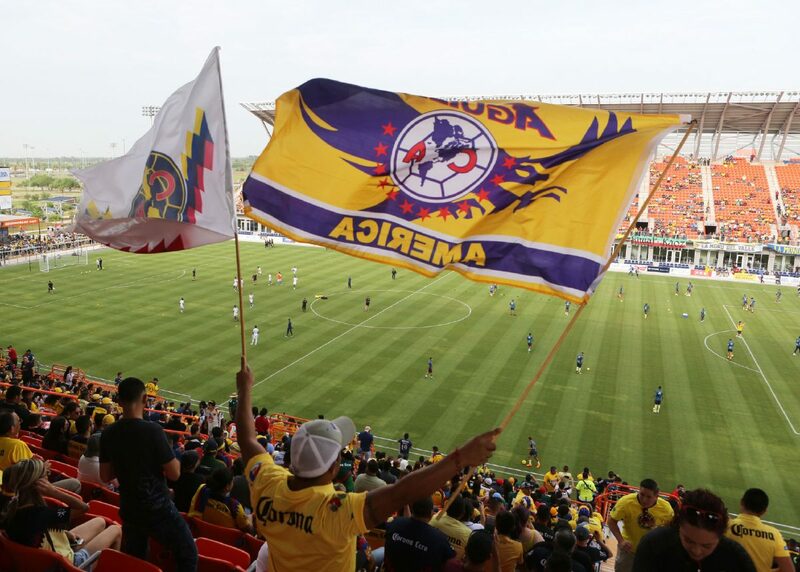 One giant América flag that was unfurled at the start of the game covered almost two entire sections of seats on the east side of the stadium. The first goal came when Perez charged out to challenge the run of América’s Jeremy Menez. Perez’s tackle tripped up Menez in the box, and the referee called for a penalty kick. América striker Cecilio Dominguez took the PK and put it in the lower-left corner, beating Perez to give América a 1-0 lead at 32:44 of the first half. When the goal went in, the largely pro-América crowd lost its collective mind. Cheers echoed throughout the packed stadium. América’s second goal took the skill level up a notch, as Dominguez played a little give-and-go with Jorge Sanchez. The key to the play was a nasty back-heel flick by Sanchez that found Dominguez alone in the box. From there, Dominguez just needed a deft touch to tuck the ball inside the right post, past Perez. In the 49th minute, Oswaldo Leon received a picturesque pass from Dominguez at the top of the box and put the ball home past Pachuca keeper Alfonso Blanco, who was subbed on for Perez at the half. Raul Lopez got Pachuca on the board in the 59th minute. He hit a curling shot from about 22 yards out that went across the mouth of the goal and into the upper-left corner, beating Oscar Jimenez, who was subbed on as keeper for América at halftime. About 10 minutes later, Juan Lopez capitalized on a giveaway by América to cut the lead to 3-2. Lopez got the ball in the box and buried a shot to the right of Jimenez. 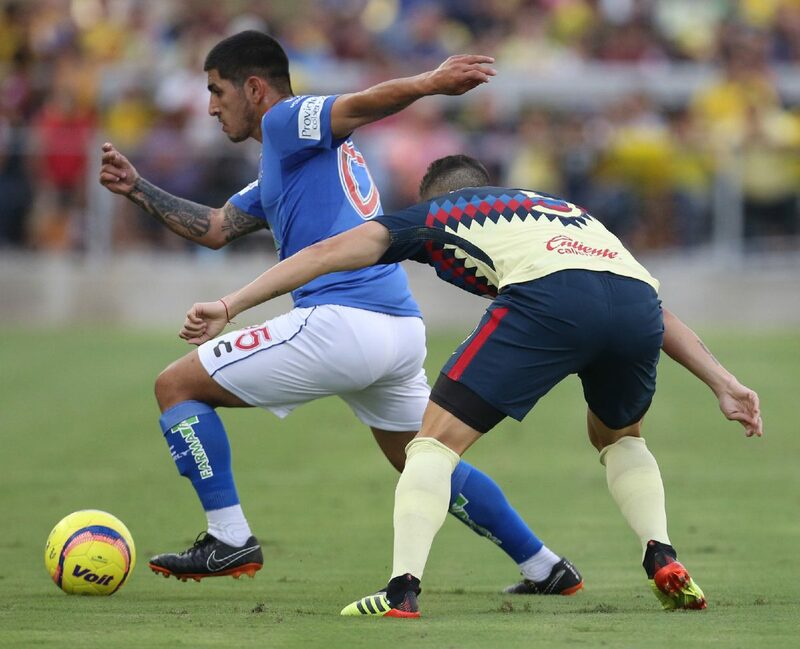 Drama started early, as Perez had to charge out of his box seven minutes in to challenge the run made by América’s Dominguez. Dominguez got the ball through and into the goal, but just as the stadium began to erupt, the sight of the official holding up his offside flag quieted the crowd. In the 23rd minute, América first-team goalie Agustin Marchesin faced a tough shot in the box from the Pachuca attack, but he stuck out his right foot and got a toe on the low shot to keep the game scoreless. A minute later, Menez missed a shot just to the left of Perez on the counterattack. Both teams are preparing for the start of the season later in July and will begin the Copa MX at the start of August.